The Romans placed more importance on the spear and javelin, than the bow. As it continues the Romani tradition, close combat and spear/javelin are the mainstay of its troops. Hence Trapezitoi were given priority over horse archers. Their position in the battleline does not reflect their worth. In fact they would more often than not they would be equipped with some of the best javelin throwing men. They would have to be good riders, in order to face the multitude of the enemies of the empire, especially Turkish horsearchers who could pierce both a horse and its rider with their arrows. It has to be noted, that even when there was peace between the Roman Empire and the Sultanate of Rum, Turkmen uc/akra (border) raiders, disrespected all authority, religion or state for a good loot. Those were their main enemies. For close combat they switch to their “kontarion” spears but they shouldn’t be used against armored cavalry, because their simple iron helmet and light “esolorikon” padded cloth gambeson armor and small 12 inches shield will be their undoing. In a pitched battle deployed in tactical combat their role would be to support the medium and heavy infantry by “ακοντίσεις” aka “javelin shots” at the enemy. Their best use would be to charge a fleeing enemy or light missile troops, or support the medium and heavy infantry by softening up their targets. To employ them against HA is to waste them, as especially the Turkish HA can outshoot them by a wide margin. Known as hippakontistai in earlier times, those guys would guard border passes to fight off light raiders, one of the multitude of Turmken tribes living on the uc/akra ( no man’s land border) between the two states, or raid themselves. They should be used with caution, not thrown away against heavier or troops that can outshoot them. 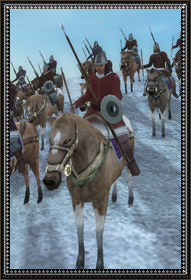 A wise commander should always keep some distance between them and other enemy troops, use their javelins with devastating effects at troops who don’t shoot back and close in only when the enemy is already fleeing.